My father never spoke about party politics, but I think his views were fairly clear. And when election time came round, although my mother always put up a Conservative Party poster in our front window, I’m fairly sure that my father’s vote cancelled her’s out. Back then we didn’t get a vote until we were 21, but when I was around 14 or 15 I started to go to Labour party youth meetings in the local Co-op hall. By then my mother had died, but I don’t think she would have minded – she was a supporter of the Co-op, we had a Co-op milkman rather than the privately owned diary, and bought all we could, mainly clothes, in the local Co-op, always being sure to remember the Co-op number so we got our divi – I think it was then paid on an annual basis, and something she looked forward to all year, the only way we ever had any spare cash. That number is engraved on my mind – and several numbers generated from it occur in my various PINs and passwords. Until a few years ago I’d always voted Labour, though only once has my vote ever led to anyone being elected – a young Gerald Kaufman in the 1970 election where he first became an MP, for Manchester Ardwick. He was amused when I told him this, around a year before his death that never since then has my vote counted. Though I still believe that Labour is more likely to understand the needs of the poorest and most vulnerable in our society, to continue to support our NHS, and generally to make a better fist of running the economy and the country than the Tories who have such a proven track record of failure (and have got us into such a mess over Brexit) their record in recent years in local governement in London has been dire. Some things than can blame on national government for cutting the money they get, but there is a real problem that they have increasinly moved to becoming businesses, run by small cabals who appear to have forgetten that they exist to serve the public. 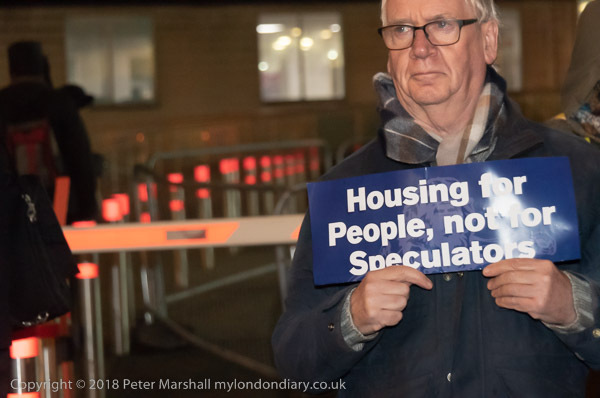 Housing is perhaps the major area of their failure, where they have failed to start with the people and their needs, and the need to build communities, but have adopted policies which destroy communites, send people in need of homes to distant areas of the country, convert huge areas of publicly owned land and assets into privately owned developments for those who can afford high market prices and rents. There are of course other areas where both Labour and Conservative Councils have failed the people, taking out ridiculous loans, becoming property investors, building expensive council offices, outsourcing services to companies that fail to deliver and more, including some more straightforward examples of corruption and councillors and officers getting lucrative jobs. Most of the councils in London are Labour-controlled, though there seems to be little to chose between them and the Tories. 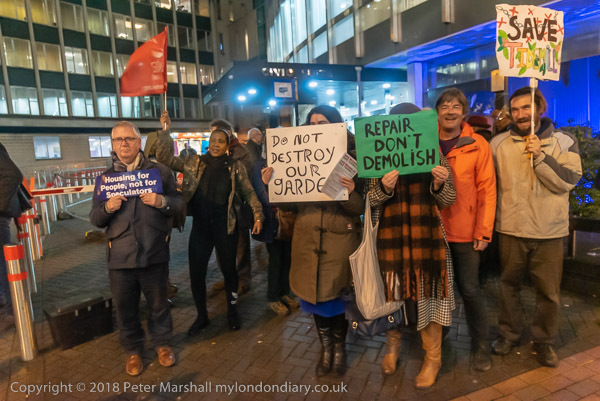 The first protest I attended on a cold, damp November night was outside the offices of Southwark Council, where the council is colluding with protperty developers to get rid of the centre of the Elephant and Castle, including a thriving street market and much used facilities by the local Latino community and replace it by a kind of Westfield-lite with little or no local connection, along with luxury flats that the people in the area can’t afford. The council don’t like what residents and in particular council tenants and leaseholders on council estates tell them about their plans. They would rather not listen to the people whose activities get in the way of their business opportunities – so they plan to get rid of the established organisations and replace them by new ones with little opportunity for public opposition and which will remove any possibility of real public involvement. 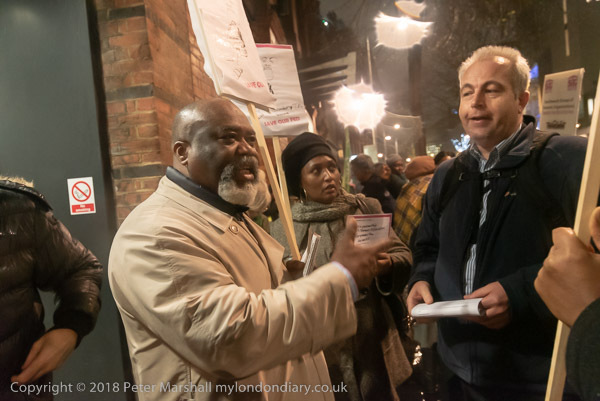 I hurried from the protest outside Southwark Council’s offices and jumped onto a train at nearby London Bridge to take me to Catford and the offices of neighbouring Lewisham COuncil, arriving there as the rain came on harder. It was cold but I got some shelter as I waited for the arrival of the protesters who came a little later than expected. 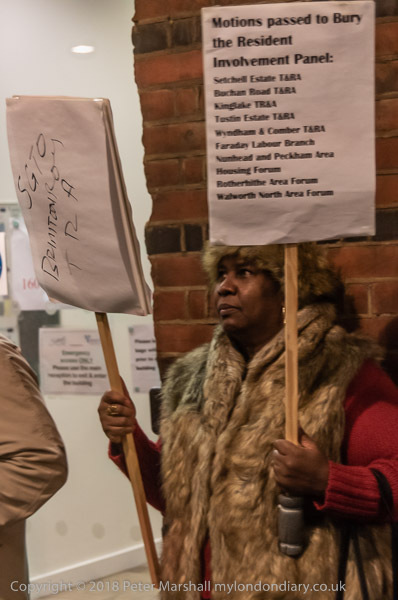 There were several groups protesting against Lewisham Council, but the main group had come over the plans to develop the Old Tidemill Garden and the adjoining disused school and council housing in Deptford together with Peabody, once a respected provider of low-cost housing, but now more a property developer whose development would provide a relatively small proportion of properties at less – and mainly marignally less – than the high market rents for the area. Protests about this development, which is destroying a highly regarded and award-winning community garden and displacing a number of tenants on council rents, have been going on for years, and the protesters have shown how the site could be developed to the same extent well keeping the garden and also allowing for the transfer of current residents to new premises on the site. But the council and Peabody clearly have had no interest and refused to engage with these proposals. 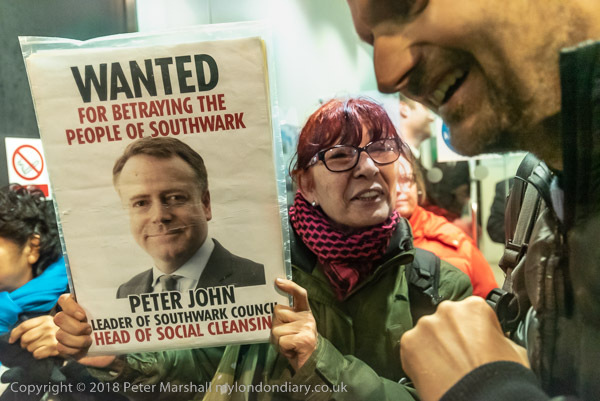 As with the Southwark protest, I’ve written about these things before on several occasions. The area outside Lewisham Council offices was peculiarly dark, getting little or no effective light from the street lighting, and I had to add light. Fortunately I’d brough both my cheap LED light source and the Nikon flash and put both to use taking pictures, with just a few made with no added light when people were closer to the street. This entry was posted on Sunday, February 3rd, 2019 at 09:50 pm and is filed under My Own Work. You can follow any responses to this entry through the RSS 2.0 feed. You can leave a response, or trackback from your own site.